If You Are Not Here, Where Are You? The influence of absence epilepsy on imagination, science and art that emerges from the inner worlds. 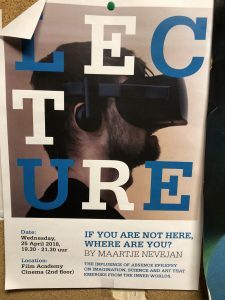 On the 25th of April Maartje Nevejan will talk about her most recent project If You Are Not Here, Where Are You? a trans media project about the often misunderstood and frightening experience that children have during an epileptic absence. Through the visualisation of childrens stories about their multi-sensory experience, the maker creates a language for the experience she had as a child. This new narrative helps break taboos and contributes to the discourse about how imagination relates to reality. Maartje Nevejan is an award winning independent filmmaker (based in Amsterdam), with a background in theatre and multi media. Her work researches and expresses the raw poetic quality of reality. Nevejan is a change maker, manifesting innovative approaches to fulfilling her visions. She brings together unexpected groups of people, from all walks of life – holding & inspiring their often contrary views into unexpected forms of creativity.